Pro-European Emmanuel Macron is set to face far-right candidate Marine Le Pen in France’s presidential run-off, results showed, making him clear favourite to emerge as the country’s youngest leader in its history. After Brexit and the election of US President Donald Trump, his first round victory – which comes after setbacks in recent months for far-right politicians in Austria, the Netherlands and Germany – shows that the political center is holding in the heart of Europe. Macron topped Sunday’s first round with 23.7% of votes, slightly ahead of National Front (FN) leader Le Pen with 21.9%, according to near-final results from the interior ministry. Macron and Le Pen will contest the run-off on 7 May. Macron, who has never before stood for election and only started his grassroots centrist movement 12 months ago, will go into the run-off as the clear frontrunner. 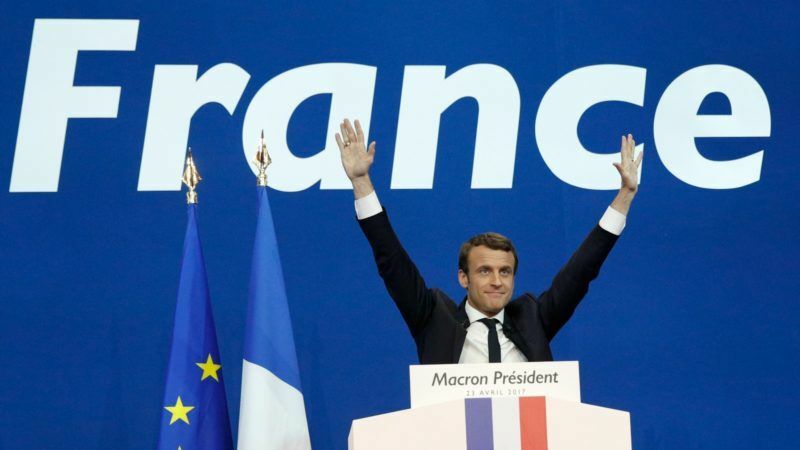 Throughout the campaign, Macron insisted France was “contrarian” – ready to elect a pro-globalisation liberal at a time when rightwing nationalists are making gains around the world. Macron would face formidable challenges as president. Nearly half of French voters opted for candidates on the extreme right and left of the political spectrum and they are unlikely to embrace Macron’s liberal democratic vision, leaving France a deeply divided nation. “For months and again today I’ve heard the doubts, the anger and the fears of the French people. Their desire for change too,” 39-year-old Macron told thousands of cheering supporters in Paris. He pledged to unite “patriots” behind his agenda to renew French politics and modernise the country against “the threat of nationalists” and pointedly didn’t mention Le Pen. At the post-election party at Porte de Versailles in the south of Paris, Macron supporters waved both French and EU flags. His victory was hailed from Brussels to Berlin on Sunday evening. In his speech, Macron mentioned the European Union on three occasions: a “Europe that protects” and that needs to be reformed. Commission President Jean-Claude Juncker congratulated Macron for his election result and wished him good luck in the run-off. “Great for Europe” said German Foreign Minister Sigmar Gabriel, who worked with Macron on ideas for reforming the European Union when both were economy ministers. Central to Macron’s approach to Europe is his belief that France must reform its own economy in order to restore a level of trust with Germany. He wants to pursue a comprehensive deal with Berlin that includes reform of the euro zone and closer cooperation on defense and migration. Macron traveled to Berlin twice this year, meeting with Chancellor Angela Merkel in March. His European advisers have said that if he wins the presidency he will not wait until German elections in September to begin discussing a roadmap for European reform with the German government. France’s only clearly pro-European presidential candidate, Emmanuel Macron, and German Foreign Minister Sigmar Gabriel know each other well. In 2015, they both published their vision for an economic and social union within the EU. Yesterday evening (16 March), they met again to discuss the future of the bloc. Macron favours transforming Europe’s bailout fund, the ESM, into a full-blown European Monetary Fund, an idea that has supporters in Berlin. He also favours a euro zone budget and finance minister, ideas less popular within Merkel’s entourage. 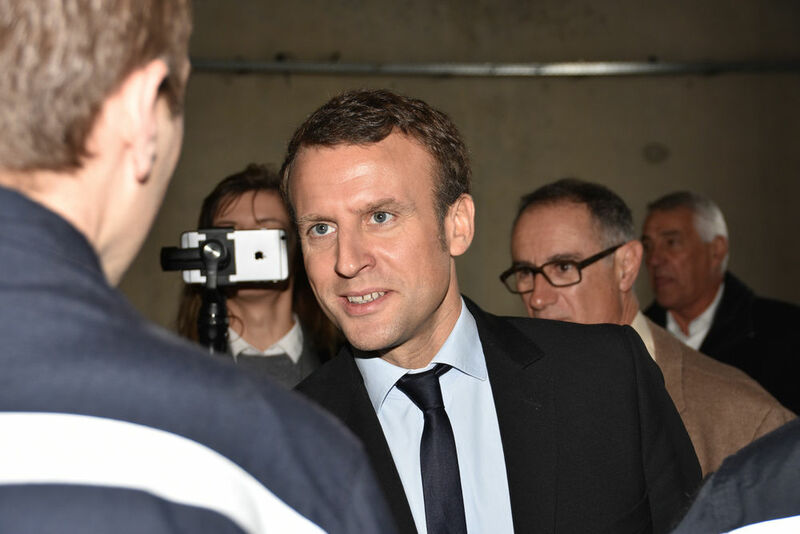 An ex-investment banker whose marriage to his former school teacher has transfixed France, Macron said the results were a clear rejection of traditional parties. Neither candidate from the mainstream Republicans and Socialists made it through to the second round for the first time in six decades, in a stunning shakeup of national politics. “The challenge is to break completely with the system which has been unable to find solutions to the problems of our country for more than 30 years,” Macron said. Macron drew immediate support from his defeated rivals among the Socialists and Republicans. Socialist Benoît Hamon, projected to win a humiliating six percent, said the left had suffered a “historic drubbing” but urged voters to keep out Le Pen who he said was “an enemy of the republic”. J’appelle à battre le plus fortement possible le Front national en votant pour Emmanuel Macron, même s’il n’appartient pas à la gauche. Fillon was seen as a favourite until January when his campaign was torpedoed by allegations that he gave his British-born wife a fictitious job as his parliamentary assistant. He was on course Sunday to score 20%. The former prime minister has accused Hollande of being behind a campaign to destabilise him and said in a concession speech the obstacles he had faced were “too numerous, too cruel”. Le Pen follows in the footsteps of her father Jean-Marie, who made it through to the 2002 presidential run-off in what came as a political earthquake for France. Le Pen Senior went on to suffer a stinging defeat when mainstream parties closed ranks to keep him out. Though Le Pen came in behind Macron, there was joy at the FN’s election party in Henin-Beaumont, a former coal mining town in northern France, with outbursts of the Marseillaise national anthem. Le Pen said the second round would be a battle over France’s future, with her vision of a France out of the EU and behind reinforced borders radically different from her opponent’s. “The major issue of this election is runaway globalisation, which is putting our civilisation in danger,” she told supporters. “Either we continue on the path of complete deregulation, with no borders and no protection… mass immigration and free movement of terrorists… or you choose France,” she added. Far-right expert Nonna Mayer at Sciences Po university said a Le Pen victory was not impossible, “but it seems unlikely that she will carry the second round”. “If she wins, it will obviously be an anti-Europe, protectionist, exclusionist line that wins and which could have troubling consequences for Europe and France,” she added. Despite Macron’s plans to “relaunch the building of Europe”, the combined scores of staunch eurosceptics Le Pen, far-left Jean-Luc Mélenchon and nationalist Nicolas Dupont-Aignan add up to nearly 50%. Support for Communist-backed Mélenchon had surged in recent weeks on the back of assured performances in two televised debates. He was on course for around 19.2% of the vote, underlining the strength of anti-establishment sentiment. The vote took place under heavy security after Thursday’s killing of a policeman on Paris’s Champs-Élysées avenue claimed by the Islamic State group. 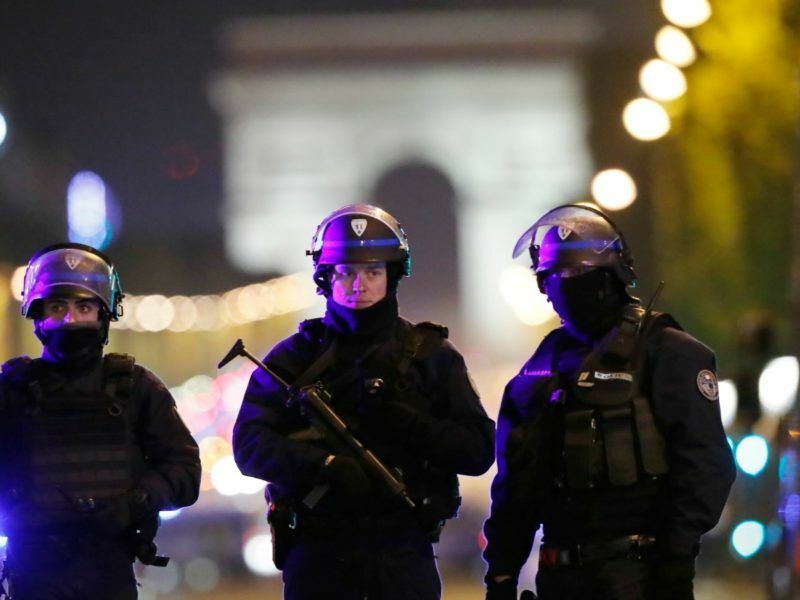 With France still under the state of emergency imposed after the Paris attacks of November 2015, around 50,000 police and 7,000 soldiers were deployed to guard voters. Thursday’s shooting was the latest in a bloody series of attacks that have cost more than 230 lives since 2015. Nearly 47 million people were eligible to vote in the eurozone’s second biggest economy and turnout was forecast to be high at around 80%. The results will be seen as a credit to French pollsters, who successfully forecast the results. BREAKING: French prime minister calls on voters to reject far-right leader Marine Le Pen in runoff and vote for Emmanuel Macron. In America they don’t have someone like Macron otherwise things might have turned out differently there too. But in the American system, they made sure that the candidate chosen by the people will not gain the presidency automatically, but that this choice remains in the hands of a group of unelected party officials loyal to the system, not to the people. Yes Gerry, that is certainly the case here. And those party officials are pretty out of tune with the population. They are also quite old. My generation that is. We could do with a Trudeau or a Macron here, but I am not holding my breath. in pretty much all previous french presidential election, the 1st round is an opportunity to vote for anti-establishment parties (left and right) as a snub, but then rally towards pragmatism in the 2nd round. in that respect, the score of LePen and Melenchon are on trend and not out of the ordinary. actually, when one realise that Hamon, the socialist candidate, was pretty much on the left of the left, but less charismatic than Melenchon, one understands the score of the latter better (ie: they were fighting for the same voters). all in all, LePen had a similar score as in the previous presidential election, and not much more than her father in 1998. the core voters of the Front National are stable at around 15% + independent voters (vary from local, national and european elections). what changed was that the traditional parties, the Socialists (explained above) and the Republicans didn’t score in the top 2 (though it was a matter of 2 percentage points in the latter case). no big surprises and no “revolution” either, just anti-establishment anger at a national level. and as I said repeatedly before, LePen is now gonna be trounced 2 to 1 in the second round (or 40-60 according to pollsters). the real question is for June, with the Parliament’s election and how a Macron presidency will manage to bring a grand coalition to run the country for the next 5 years. Later poll says 61-39 but the Parliament vote is more critical. It is quite something to go from nothing to trying to build a workable majority. In that sense Macron’s newly created En Marce! is both a (presidential) blessing and a (parliamentary) curse. It would be quite a renewal if he can pull it off and send both the socialists and the gaullists to the scrapheap of history. But it is still a long shot.